This week we will focus on why and how teachers can use Web 2.0 tools for the creation of digital stories for personal and professional purposes. Applying personal knowledge of digital and media processes, products and issues, will engage today's teachers and learners in rich, rewarding inquiries and develop essential skills. Digital storytelling is the focus for this inquiry approach to learning with and about digital literacies. Last week we examined Henry Jenkins notion of participatory culture. As we explore why digital storytelling is important in educational contexts, it's critical to make connections to the characteristics of participatory culture and the elements of digital citizenship. Samantha Morra identifies six elements of great digital stories and presents the process involved in creating digital stories. Bernajean Porter's wiki site provides some rich resources to engage in the process of digital storytelling, including links to tools, research, media making, storyboarding, editing, idea starters, tutorials and storytelling galleries. Porter also explores Digital Storytelling in The Art of Digital Storytelling. Joe Lambert shares details about work being done through the STORY CENTER. According to Bernajean Porter, there are six fundamental elements to digital storytelling. Becoming familiar with the application of MINDOMO is an essential step to incorporating this tool into your teaching practice and using it for the mapping portion of the upcoming digital story assignment. THEN: watch these two introductory screencasts to learn how to use this digital tool. Additional video resources are available on the OSAPAC web site. Click this link to learn more about setting up Mindomo for student use, presentations and sharing mind maps. What is Digital Storytelling? Defining this 'thing' called DS is an important first step for your own understanding. Begin with a preliminary concept map about what you think you know about DS. Connect from today's assigned readings to this Educause Learning Initiative document titled "7 things you should know about Digital Storytelling". Add to your concept map any new or additional connections to your understanding of DS. Share your concept map with your table group. Compare and contrast your ideas with that of the other people in your group? Review what you know about digital storytelling. What is DS? What is NOT DS? How do you know it's DS? How is it the same or different from traditional storytelling genres? Do similar story genres apply (e.g. fiction, non-fiction, historical fiction, mystery, fantasy, etc.)? Are the elements the same? Do writing traits also apply? Collect your ideas, connections and concepts in a mind map using Mindomo. Each group member should select one or two of these links to investigate - divide the task and then share with the other group members what you have discovered before adding your information to the collaborative MINDOMO space. DS: What it is ... and what it is NOT. 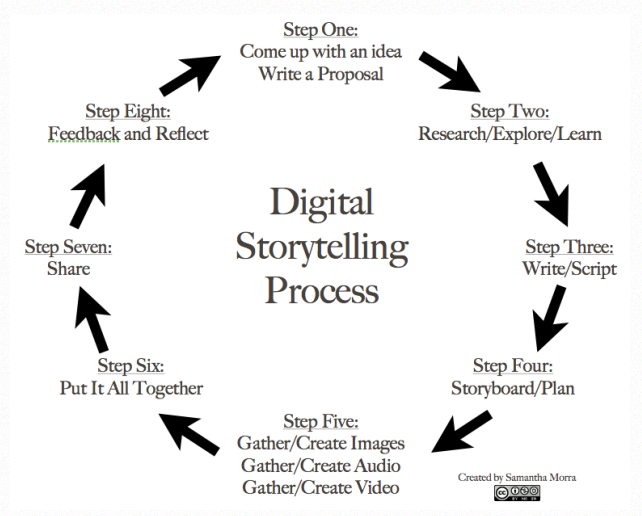 What is the process for digital storytelling? Does it follow the same steps for writing as traditional print? What are essential elements for a digital story to be effective? How do you assess and evaluate the process and the finished story? PROCESS: Examine the three suggested processes presented here (each graphic links to the original source for more information). How are they the same/different from each other and from the writing process found in the Ontario Guide to Effective Writing Instruction Kindergarten to Grade 3 (link and review pages 1.11-1.14). Add details of the process to your individual concept map for future reference. Reflection should be incorporated into the process and can be done at the beginning and end of the story writing journey. PRODUCT: To establish success criteria for digital storytelling, there needs to be a clear set of expectations for the finished story. Since each story can be a unique production, the assessment needs to match the task, for both process and product. Examining some assessment and digital storytelling rubrics will shape a collaborative understanding. As you investigate each of these resources, collect and collaborate on your MINDOMO map to capture essential elements and ideas in four key areas - content, process, presentation and form. 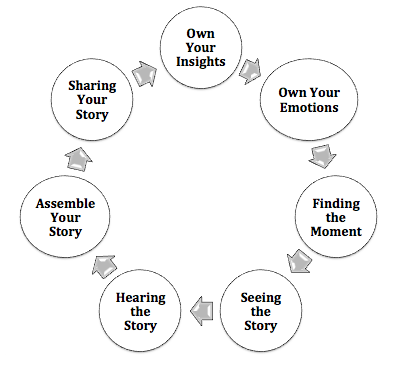 Apply what you now know about digital storytelling (process and product) to analyze some examples of digital stories. OR visit the STORY CENTER site where there are stories to match specific themes - family, identity, relationship, community, health, healing, place, environment, education, work, social justice, human rights, and youth voice. As you view or respond to the story, think about these questions to focus your viewing. What evidence of learning did you see in the finished story? What is the purpose of the story? How do images, movie, music, narration, text and transitions shape the story for the viewer? What elements contribute most to the story? What elements hinder the flow of the story? What issues come to mind when connecting the story to the author, audience and context. Created by Hannah, a Gr. 4 student in Alaska, this story shares traditional cultural values and applied 'green screen' storytelling. Created by Wayne Richard during a Center for Digital Storytelling workshop, this story uses the metaphor of a sofa to create a the story that touches on life lessons learned from a sofa. Created by a group of students to document the 'problem-resolution' they outline how to animate a rolling ball. Take a look at these personification stories in this lesson. Now let's personify an object and write it's story. Then let's BLABBERIZE your story to make it come to life. Watch this tutorial video to learn more. There are other literary techniques that can apply to your digital stories, such as similes and metaphors.